To improve the independent character of each person and to support the independent movement of each nation. Amnesty International and Taiwan Friends of Tibet. I join them as a member and volunteer, and participate in their activities a lot. 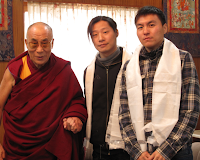 Also, I organized a Free Tibet Concert in 2003 and I have participated the Free Tibet campaign in Taiwan since 2000. We have a Free Tibet protest each March. To visit Dharamsala where the government of Tibet in Exile is located was always my dream. Since we decided to organize a Free Tibet Concert again this year, we decided to visit Dharamsala to record some information and film some footage to introduce the Tibet Issue to more young people in Taiwan. Before we took off, we decided to send an email to Dalai Lama's office to see if there was a chance that we could have a short interview with him to play during the concert for the audience. 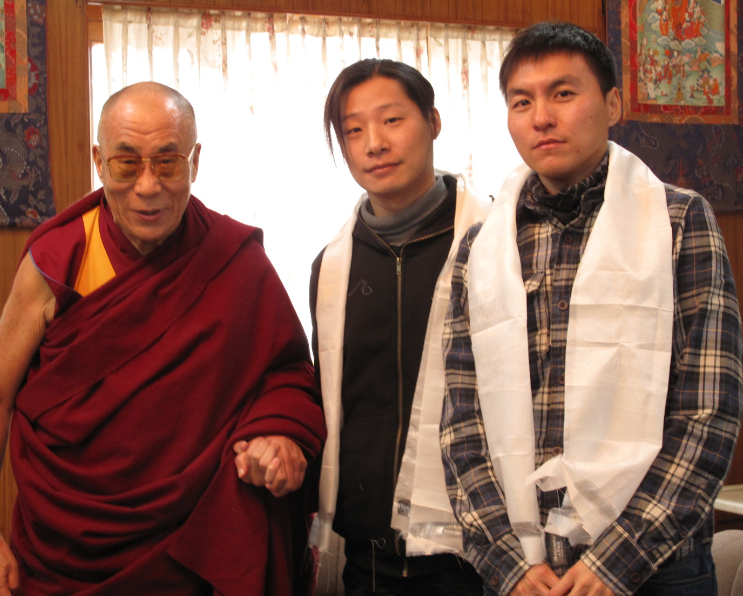 We didn't expect too much, we would have gone whether we could meet His Holiness or not. The day before we left for India, we got confirmation from his office that we would have 5 minutes to shoot the video. On the day we met him, he extended the conversation suddenly and we had the meeting for more than 20 minutes. We were surprised and it was our greatest honor to film this short interview. His Holiness has said that the Tibet issue is not about Tibet, but also justice, freedom, democracy, and human right. And these values are what we believe, too. In 2009, the year of 50th anniversary of Tibet in Exile, I think it's time for all the citizens in the earth to reconsider what values are and what we should do to fight for these values. That's why we will organize a free Tibet concert again this year. Taiwan is a nation that has suffered from foreign colonists and dictators for hundreds of years. Now we have finally built up our own democratic system and Taiwan has finally become a free country. There are still strong conservative and autocratic forces inside Taiwan that might damage our democracy and freedom, but I still appreciate very much that we finally have what we've gotten now. On one hand, we should improve the quality of our democracy and terminate the autocratic force; on the other hand, we should fight for the rights of all the individuals and peoples who still live under oppression. Is there a particular way you would want to encourage readers to be involved? There are many cool music activities which are organized by non-profits working for human right causes. Join them! We have written a song called "UNlimited TAIWAN". It's for protesting the oppression from the international society. Taiwan is a democratic and modern country. But under the pressure from China, the international society doesn't treat Taiwan as a country with full rights, which all the other countries share. Taiwan is still not a member of the United Nations. We don't have a representative there fighting for our international rights. As a citizen lives in a modern society, we share rights and we give our concerns to the others. Do you have any tattoos that relate to your social/charitable beliefs/work? My tattoos on my left arm are 9 radial-shape objects such as sun, freak bird, fire skull...etc. They are metaphors of my 9 goals that I would like to work for in my whole life. One of the goals is that I want to fight for freedom, human right, and independence of all the nations.